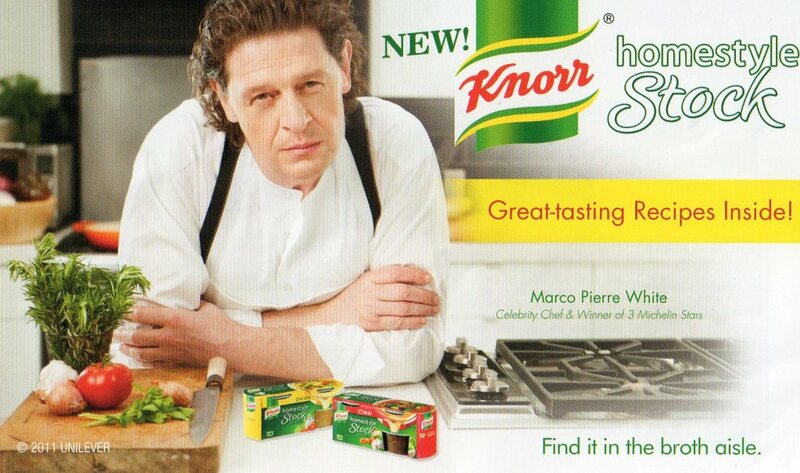 Chef Marco Pierre White is the spokesman for Knorr (and has been for quite some time, apparently) – a situation he looks none-too-pleased about. Granted, Chef White does not have a reputation for being a pleasant person. In fact, he was once the mentor of culinary enfant terrible Gordon Ramsay, and rumor has it that he made Ramsay cry. Nevermind the fact that most Americans don’t even know who the hell he is – for one thing, he’s British, and for another, he doesn’t even have a show on the Food Network. But, you can’t tell me that a professional photographer couldn’t convince White to smile, even slightly, in order to sell some product??? I mean, he got paid for this, right? Isn’t that worth a sideways smirk? A raised eyebrow? Something to make him look even slighly less than annoyed? Knorr’s UK website doesn’t seem to have any smiling pics of Marco, either – and, oddly, the US website has no mention of him at all. This campaign must be a way to introduce him to Americans in a totally friendly and non-threatening way. At the time of this writing, I wasn’t feeling creative enough to attempt a clever caption for this ad. Care to assist? Next Next post: Schenectady Greenmarket Local Harvest Dinner – Tickets Available! I have not seen that movie…but I think I have to now!